One of the things I try to do every year is to send some treats to school with my kids for Halloween. Some years those treats aren’t food, and instead come in the form of seasonal trinkets such as erasers and pencils (especially the stacking point kind because it brings back so many happy memories from my childhood). 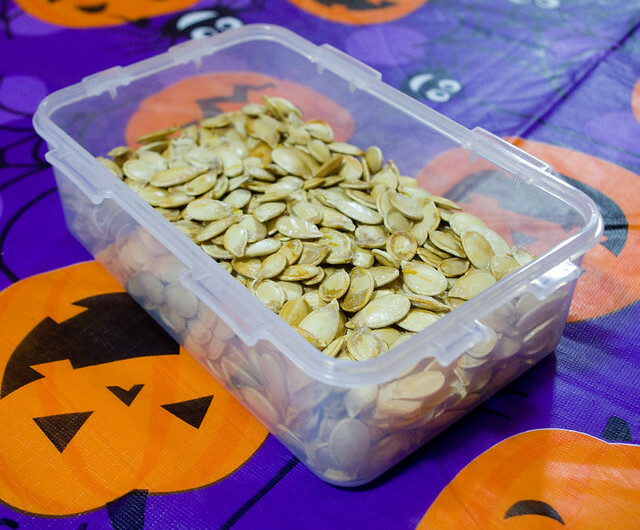 If I choose to send along food, I prefer for it not to be straight-up candy, since I know that the kids will be getting enough of that when it comes time for trick-or-treating. This year, Thing 2 requested that I whip up another batch of her favourite Graveyard Five-Layer Dip, which was an easy enough wish to grant. But since Thing 1’s favourite thing is, in her words, “chocolate with chocolate in it and chocolate on top,” I had to make something else for her. 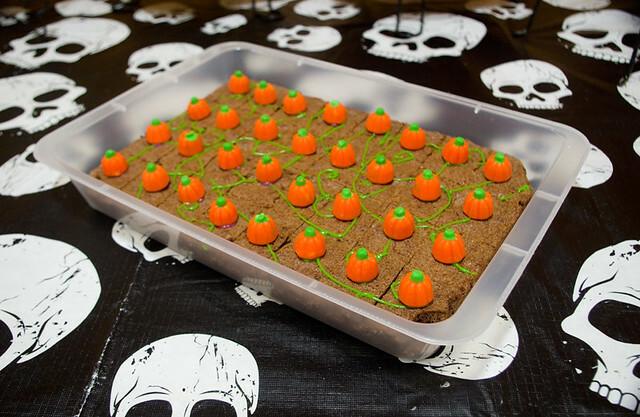 I was inspired by Delish’s Pumpkin Patch Brownies for Thing 2’s dish, enough so that I even baked a second batch for her to take to her Girl Guides Halloween party as well. However, I wanted to make the brownies themselves from scratch instead of from a boxed mix. (I generally find that if a boxed mix requires additional eggs, water, and oil, you’re really just paying a lot extra per pound to have someone pre-mix your dried ingredients for you.) I used the Book Club Brownies recipe on page 762 of the Joy of Cooking (75th Anniversary Edition, Rombauer & Becker, 2006). It’s a solid recipe that is based on the Brownies Cockaigne that has appeared in Joy since the original 1931 edition. Since I knew that these brownies would be eaten in a classroom, I opted for making them slightly less messy by not adding the frosting and Oreo “dirt”. Instead, I just traced the “vines” on with green icing and made sure that every square got a pumpkin — since every kid argues about which piece is “better” based on number of toppings. As can be surmised from my Happy Halloween! post, we also carved our pumpkins this year. In an attempt to waste as little food as possible, I had the girls separate the guts from the seeds while I cleaned out the pumpkins. Then I roasted the seeds with a drizzle of olive oil and a sprinkle of salt, on a sheet pan in the oven for about 30 minutes at 300°F (150°C), checking every ten minutes or so. They turned out lovely and will make a wonderfully crunchy, salty snack while they last. It always surprises me how few seeds you get from a single pumpkin! This is the result of five quite large gourds, and it probably won’t last us a week.